Ella Cara Deloria is best known for her linguistic and ethnographic work on the Sioux Nation. Though not formally trained as anthropologist, she gained a reputation in the field. She brought a new perspective on her work, as she was born on the Yankton Sioux Reservation and part of a traditional Dakota Sioux family. Deloria grew up on the Standing Rock Reservation in the northern part of South Dakota. She was born into a prominent family. Her grandfather was a tribal leader and her father was an influential Episcopal Minister. Her nephew, Vine Deloria Jr., was an attorney and well-known author. The Delorias spoke both the Dakota and Lakota dialects of the Sioux Language. It was through the understanding of the Dakota and Lakota that Deloria would find her place in history.The Deloria family members were devout Christians, but also followed the traditional ways of the Dakota people. It was thought this early exposure brought Deloria to the field of anthropology. Deloria and Boas enjoyed a lengthy working relationship. He often contacted her to translate and analyize texts. In 1926, Boas arranged for Deloria to come to New York to begin further collaborations. (DeMallie, 1988) It was in New York that Deloria came to know Ruth Benedict. Benedict and Deloria began correspondence that would last until Benedict's death. Many of the letters between Deloria and Benedict were not opened until 1998 (Gardner, 2000), and as such are not widely as recognized as the Boas connection. It was Benedict's advice that helped Deloria focus on kinship, tribal structure, and the role of women. (Biography Resource Center). In her efforts to research traditional culture of the Lakota and Dakota Sioux, Deloria interviewed elders and tribal historians. One of Deloria's highest achievements was the novel, Waterlily, which set about to use the work Deloria had collected. Ella Cara Deloria died February 12, 1971 in Vermillion, South Dakota. She left a great archive of Siouan language notes, ethnological observations, and legacy of devotion to her people. Her legacy was formalized as the Ella C. Deloria Project at the University of South Dakota. 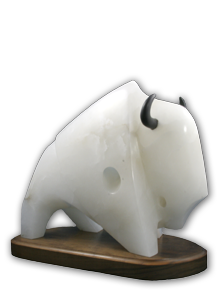 The project is an ongoing effort to preserve the culture of the Dakota people. 1929: The Sun Dance of the Oglala Sioux; American Folklore Society. 1932: Dakota Texts; reprinted 2006 Bison Books. 1941: Dakota Grammar, (with Franz Boas) National Academy of Sciences; reprinted 1976, AMS Press. 1944: Speaking of Indians; reprinted 1998, University of Nebraska Press. 1988: Waterlily; reprinted 1990, University of Nebraska Press. 1993: Ella Deloria's Iron Hawk; single narrative, ed. Julian Rice. University of New Mexico Press. 1994: Ella Deloria's the Buffalo People; collection of stories, ed. Julian Rice. University of New Mexico Press. Celebrating Women Anthropologists. Ella Cara Deloria. Celebrating Women Anthropologists: DeMallie, R. J. (1988). Afterword. In Waterlily. Lincoln and London: University of Nebraska Press. Gardner, S. (2000). Speaking of Ella Deloria: Conversations with Joyzelle Gingway Godfery, 1998-2000, Lower Brule Community College, South Dakota. The American Indian Quarterly, 24(3), 456-475. Hoefel, R. (2001). "Different by degree": Ella Cara Deloria, Zora Neale Hurston, and Franz Boas contend with race and ethnicity. The American Indian Quarterly, 25(2), 181(23). InfoTrac OneFile Plus. Biography Resource Center. (n.d.). Ella Cara Deloria. Picotte, A. (1988). Biographical sketch of the author. In E.C. Deloria , Waterlily. Lincoln and London: University of Nebraska Press.